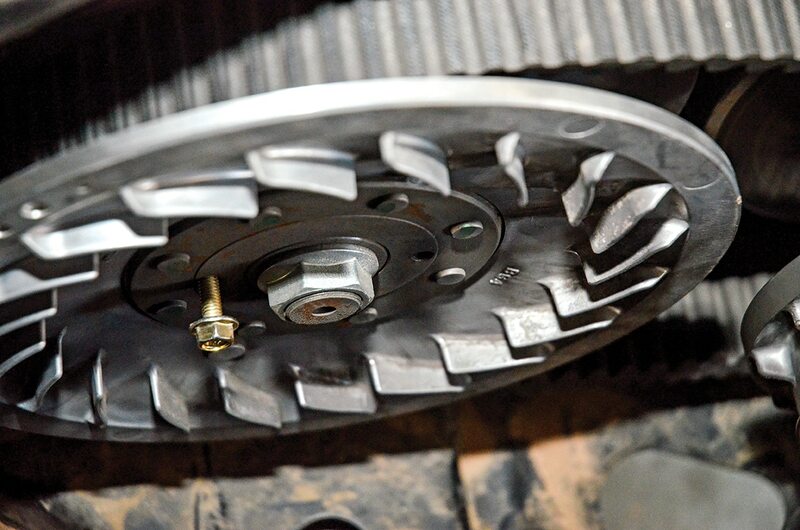 If you’re doing a lot of high-altitude, technical trails or wanting bigger tires for your 2018–2019 Wolverine X4 (or new Wolverine X2), Yamaha has an inexpensive accessory—the oversize tire clutch kit (part number BG4-E63H0-V0-00, $49.99, X2s may have a different part number)—for you. 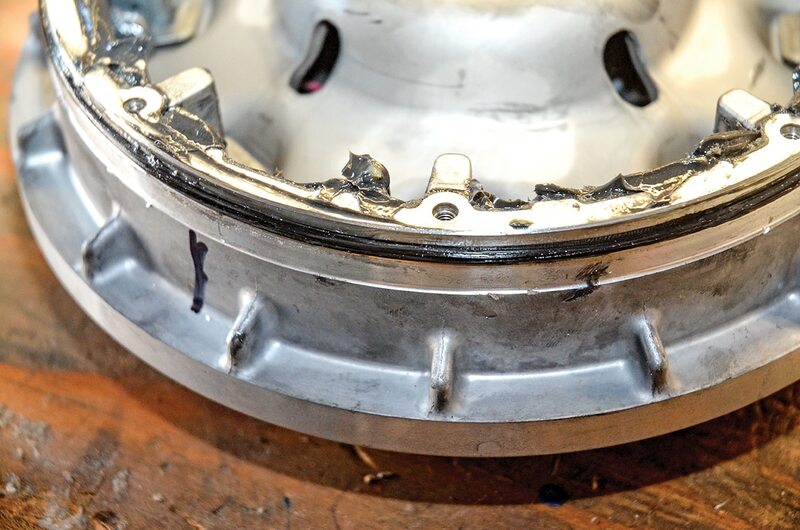 The kit includes eight rings called “primary sheave weights” that replace the OEM weights and engage the clutch much quicker. The setup is really ingenious in that it doesn’t require a press or specialized tools to change the sheave weights once you remove the primary-clutch sheave. 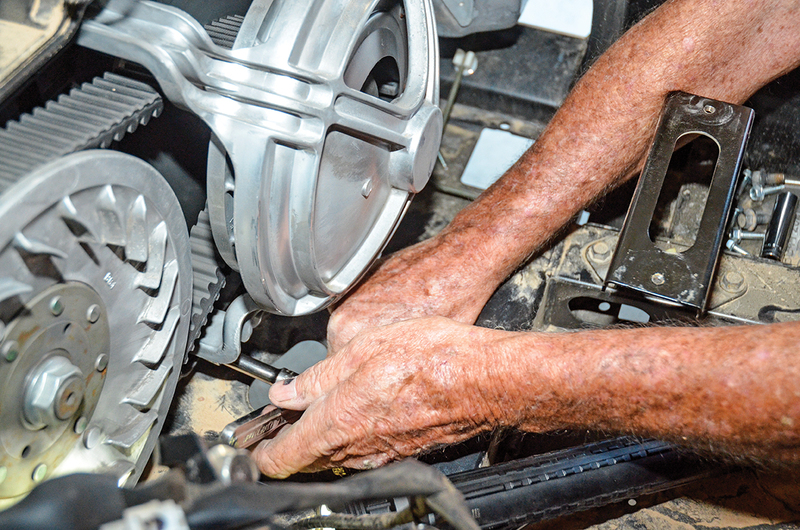 However, getting the CVT cover off to access the primary clutch does require specialized tools, and Yamaha recommends Wolverine X4 owners have the work done by an authorized Yamaha dealer or qualified mechanic. Being adventurous types, we took on the project ourselves, and it turned out to be just that—a real adventure. 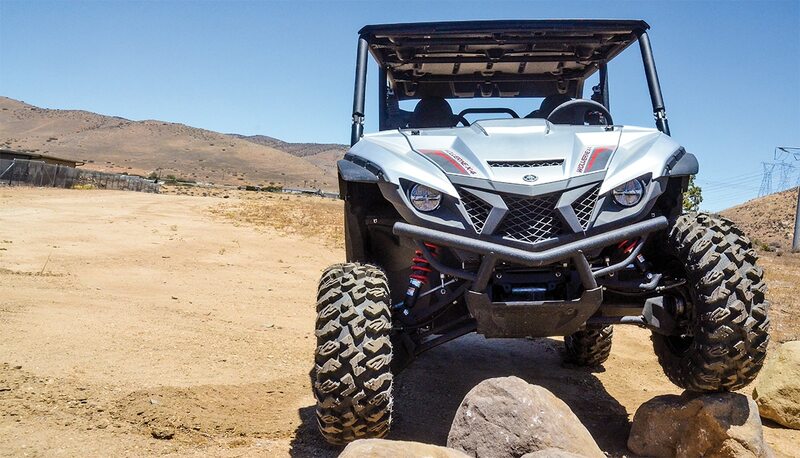 Dating back to the first days of the Yamaha 660 Rhino and then the 700, we have only blown one Yamaha CVT belt. On a Baja Rhino Tour with Greg Bringle, we blew a 660 belt after a particularly abusive beach photo session. 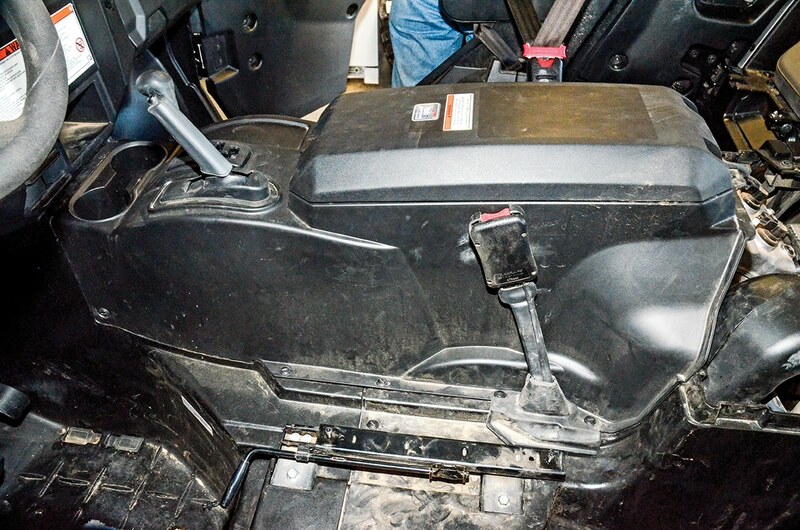 To change the Rhino belt, Bringle removed the driver’s seat and dismantled the seat base to access the CVT cover, and it took about an hour to complete the job. The Wolverine X4 is more complicated than that. 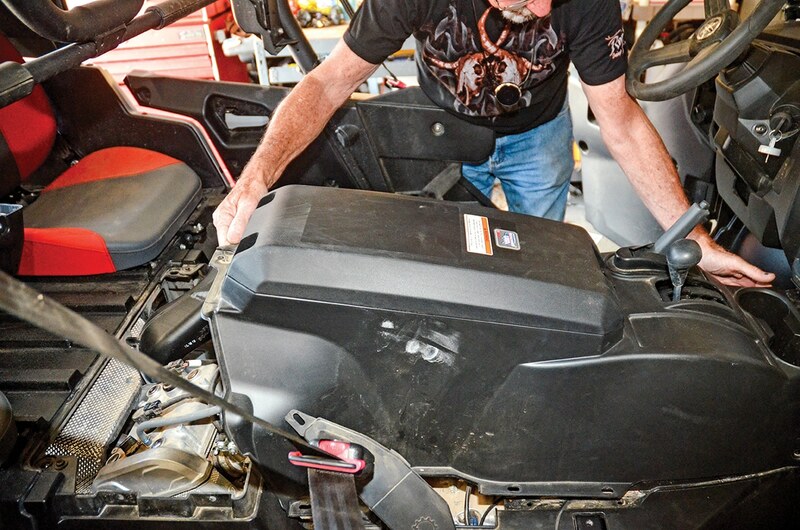 If you blow an X4 belt on the trail, a well-stocked toolbox isn’t going to cut it; you’ll need a tool chest with professional power tools and swivel extensions. We had to remove both seats and the engine cover to get to the console. 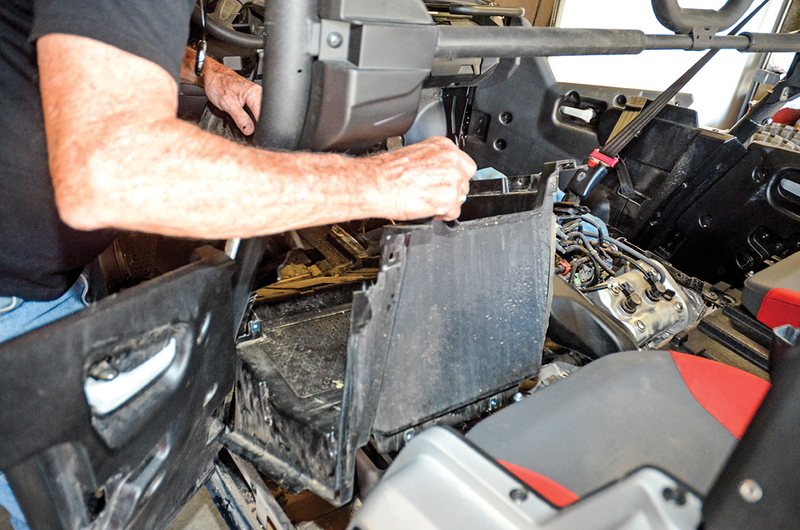 Then we had to remove the driver’s seat rails, left-side trim with the rear 12-volt power port and left-rear door latch to remove the left-rear floorboard, the floorboard brace and driver’s seat/seatbelt subframe to access the CVT cover. Here’s the step-by-step process that will save you big bucks. 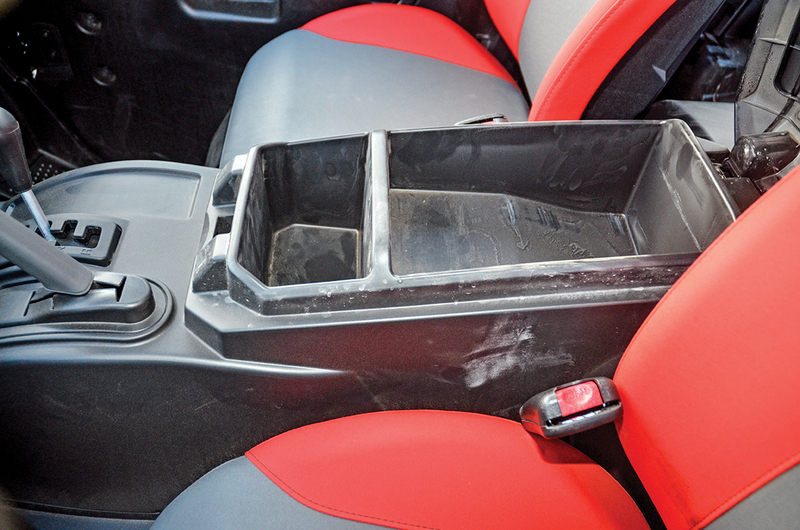 The center console has to be removed, so start by engaging the parking brake and removing the front seat bases. The seats will also need to go, so remove the four bolts holding the passenger seat to the seat base and the driver’s seat frame from the sliding adjuster rails. Remove the plastic two-piece rivets along the base of the console on both sides. They’re slotted like a flat-blade screw but don’t want to thread out like one, so we used two screwdrivers, the second to pry the rivets up. With all the rivets removed and the parking brake lever pulled up, the console can be tilted forward and pulled out. We had to move the range selector for clearance. 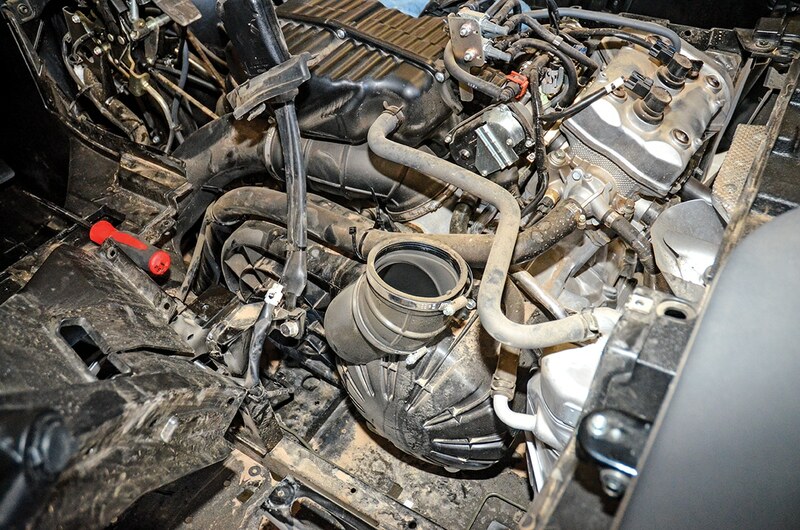 We loosened the two reusable zip-ties holding the engine coolant hose and moved it inward. 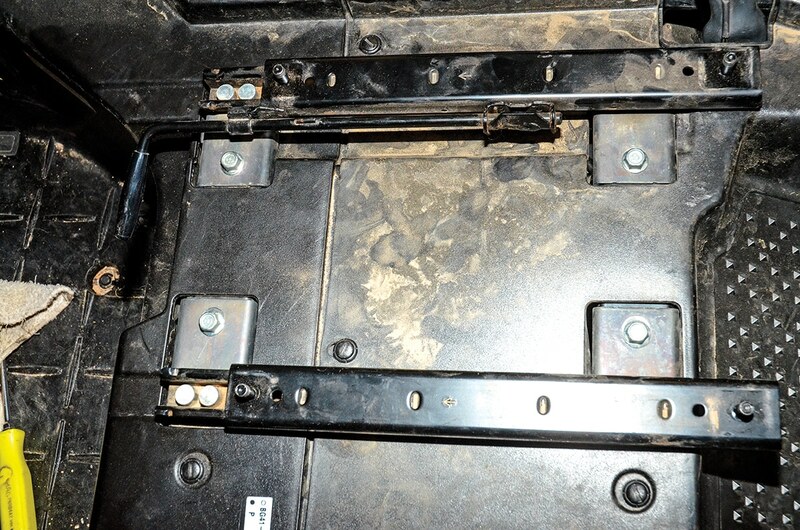 Next, the driver’s-seat adjustment rails need to be removed. The bodywork fun is about to begin, as the left-rear floorboard has to be removed. 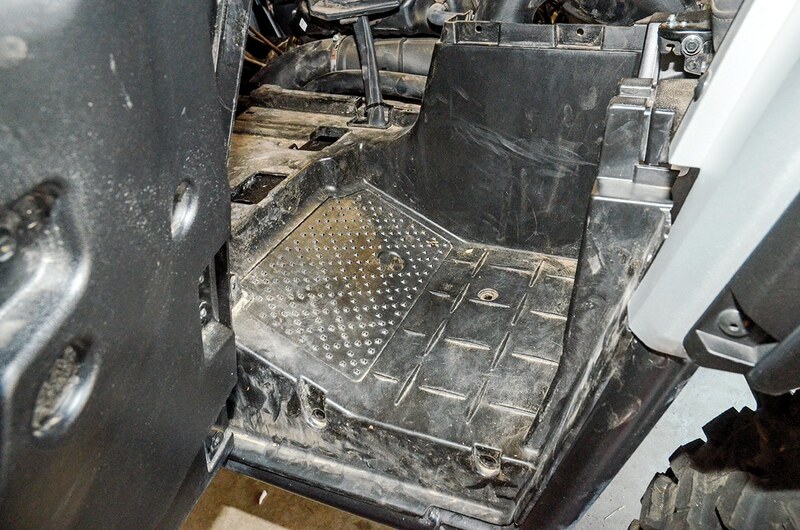 To get the floorboard out, the liner between the left-side doors has to be unbolted. We then slid the seat belt out of the lower slot and let the panel hang by the 12-volt power outlet wiring. The left-rear door-latch also has to go, and the bolts holding the front of the left-rear fender had to be removed, but not the whole fender. There are also two bolts under the left-rear wheel-well that must be removed. After the floorboard is removed, the floorboard support bracket should come off as well; it saves time with the CVT-cover bolts later. 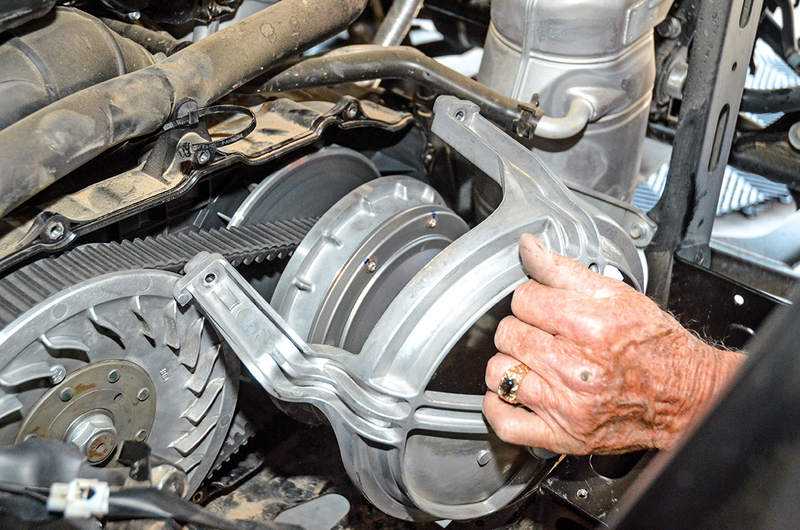 Loosen the hose clamps for the top CVT duct and 90-degree elbow cooling the secondary clutch. Next, the driver’s-seat L-bracket and seatbelt anchor assembly have to be unbolted to get the CVT cover off. 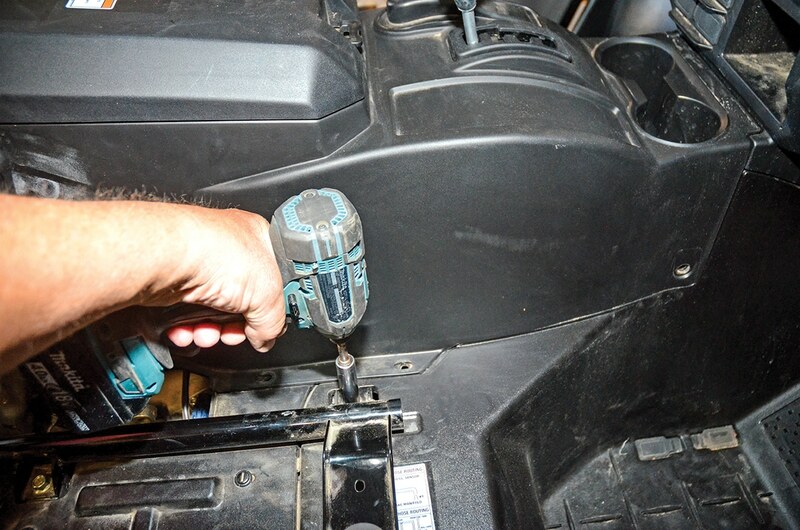 Remove all of the CVT-cover fasteners with a 10mm socket. We used several extensions, including a swivel head to reach the bottom bolts. Next, remove the four bolts holding the primary’s outer-bearing bracket. With the outer-bearing bracket removed, we used a 1 1/16-inch socket and impact wrench to remove the primary-clutch nut and washer. 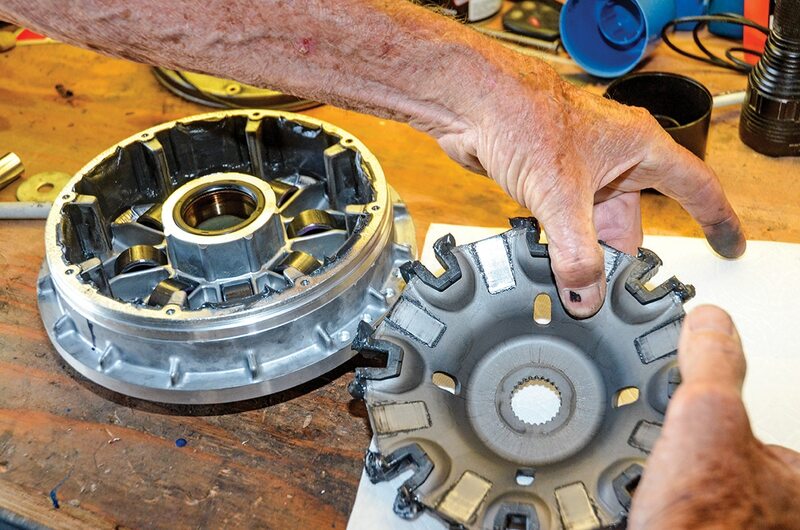 Take the primary clutch to the workbench. Remove the eight Phillips screws holding the cover on the primary. We marked the cover and housing so we could assemble it properly. 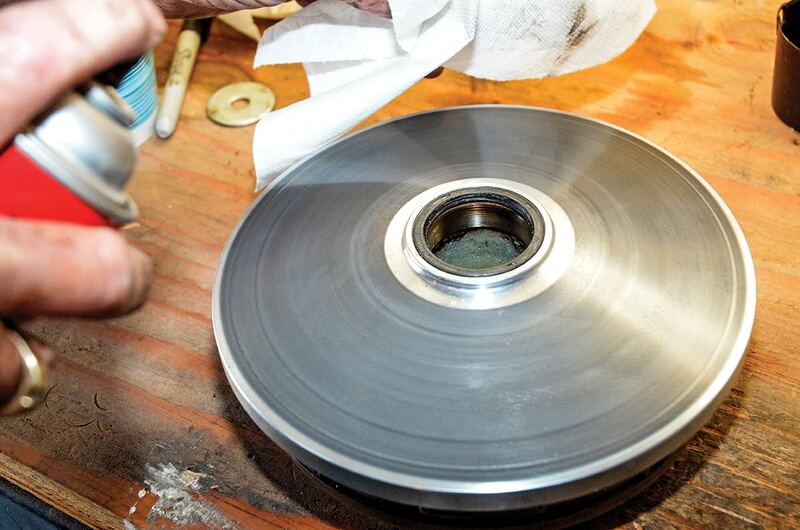 Next, carefully remove the sliding inner sheave and place it on a rag or paper towel. Do not remove the grease, unless you’re going to re-grease it with fresher lube. Here’s the primary with the OEM sheave weights. Fish all eight out with a pick and replace with the oversize tire CVT kit weights. 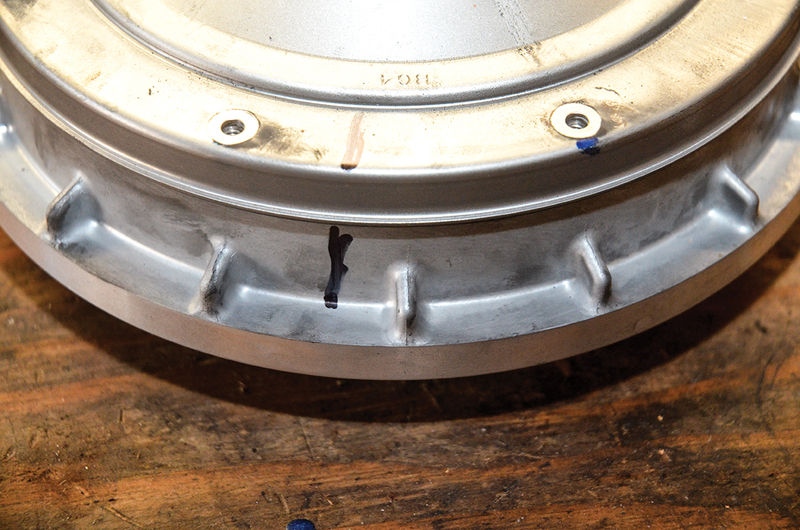 With the eight new rings in their ramp slots, slide the inner sheave/cover back onto the sliders inside the housing. Press it home by hand and replace the O-ring onto its lip. Replace the cover with the Sharpie marks lined up and replace and tighten the eight cover screws. We then stuffed a rag in between the cover and sliding inner sheave so it wouldn’t expand and let the sheave weights fall out of their slots. 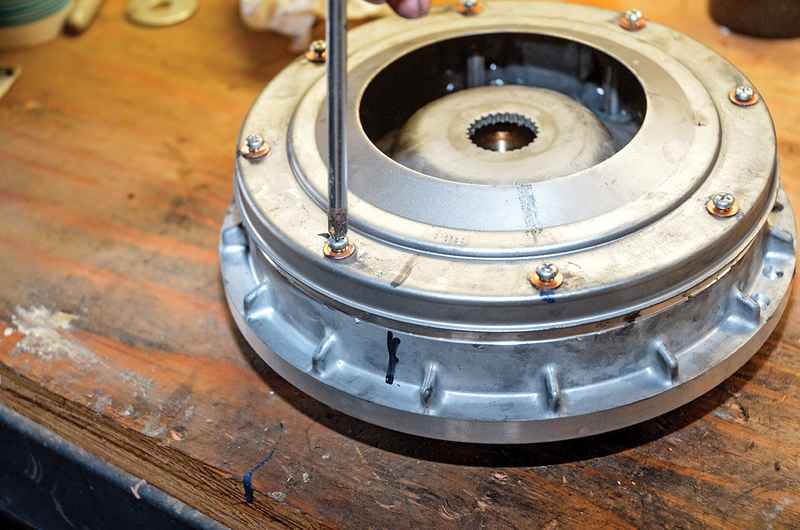 With the rag keeping the inner assembly compressed, we flipped the primary over to clean the sheave surface. Also, clean the inner sheave on the engine side. Run a bolt into one of the holes (or both) in the secondary to separate those sheaves. Slide the primary onto its floating spacer and compress until the inner sheave goes over the splines on the primary shaft. If it won’t go on, the weights have likely escaped their slots; that’s why we kept it compressed with the rag. 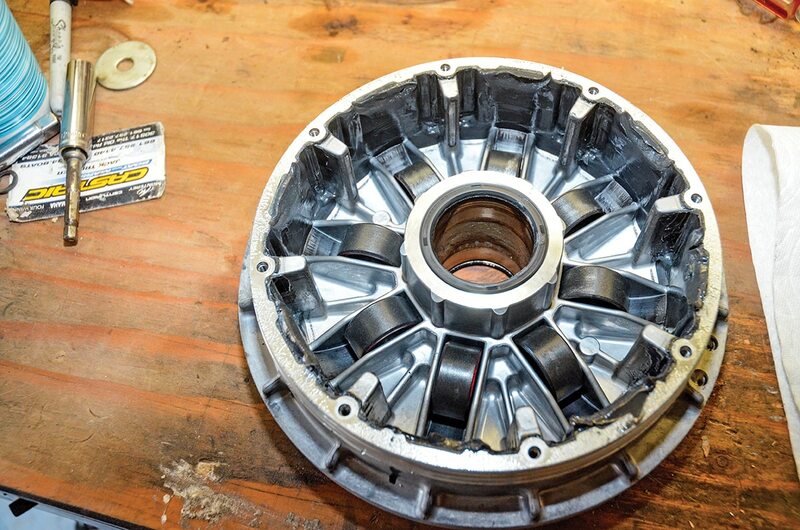 Replace the large washer and nut, remove the rag, and impact the primary nut. The washer should center itself as it slides onto the splines. 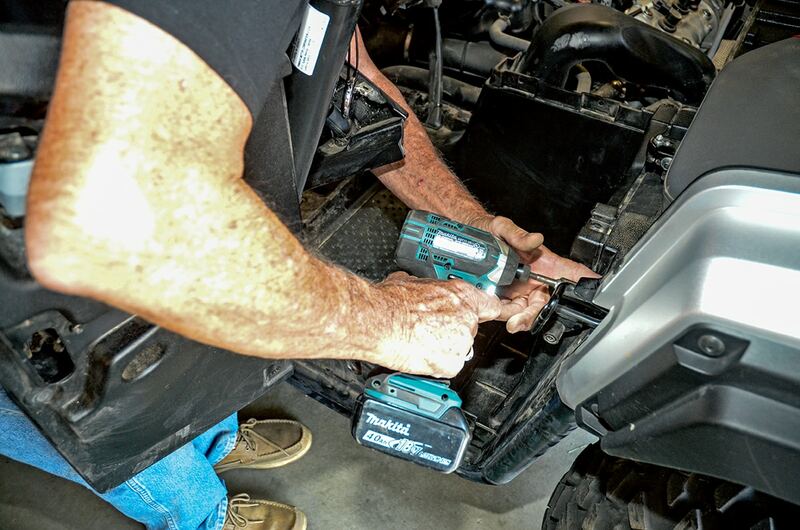 Replace the outer-bearing support bracket and tighten the four mounting bolts. Remove the screw(s) separating the secondary sheaves. 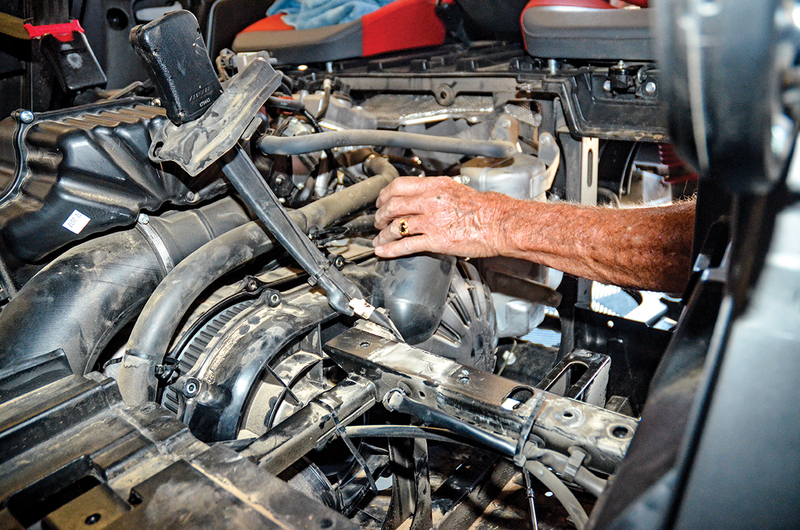 At this point, we carefully started the engine to check our CVT work; all was well. 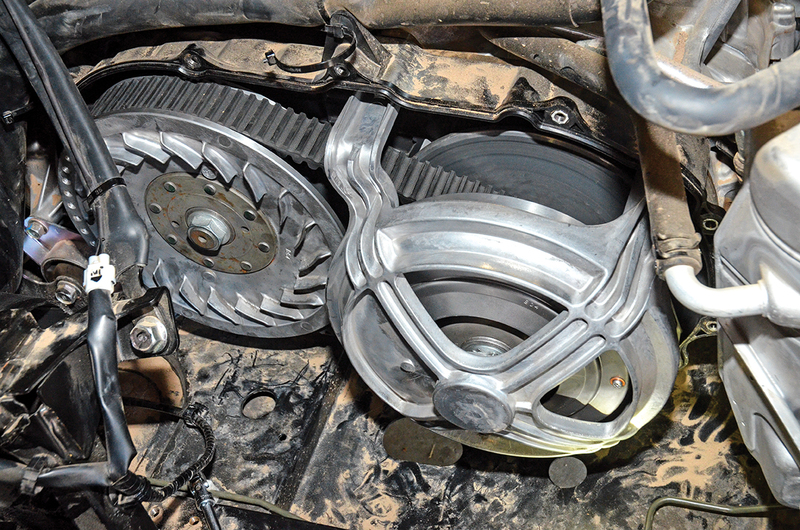 Replace the CVT cover, tighten the cover screws and replace the CVT upper duct and elbow. Center the hose clamps in their grooves and tighten. 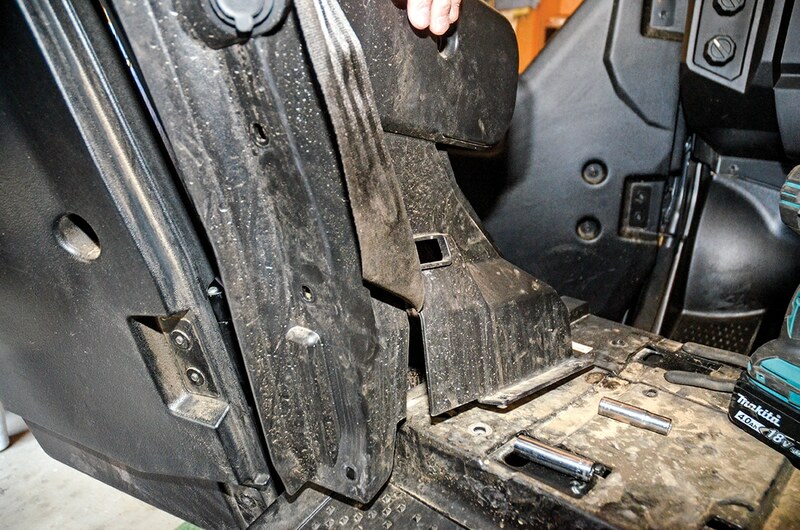 Replace the seat-bracket bolts and the floorboard bracket and bolts. 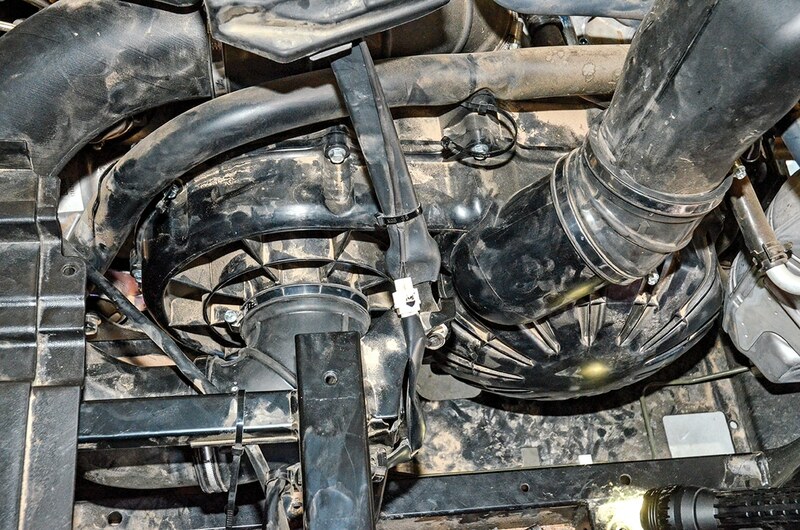 If you moved the coolant hose like we did (see photo), put it back in place and zip-tie it. Work the floorboard back into place and underneath the fender and between-door-panel lips. 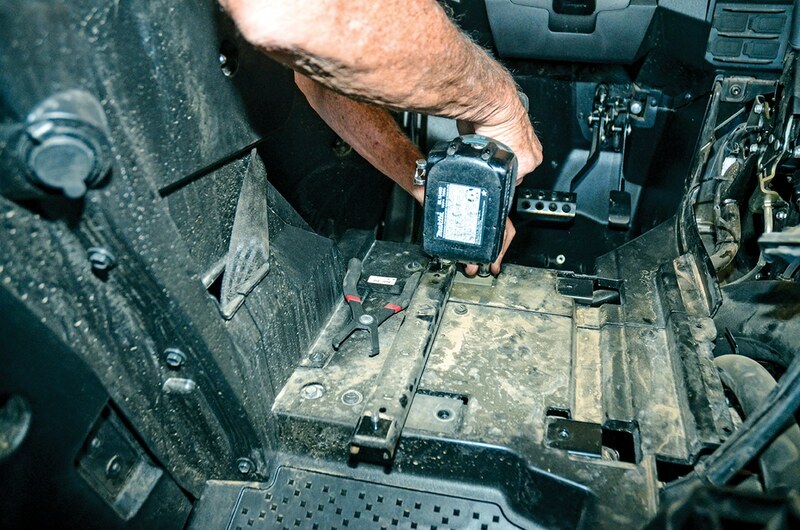 Replace and tighten all of the floorboard bolts, including the two in the fender well, and replace the door latch. 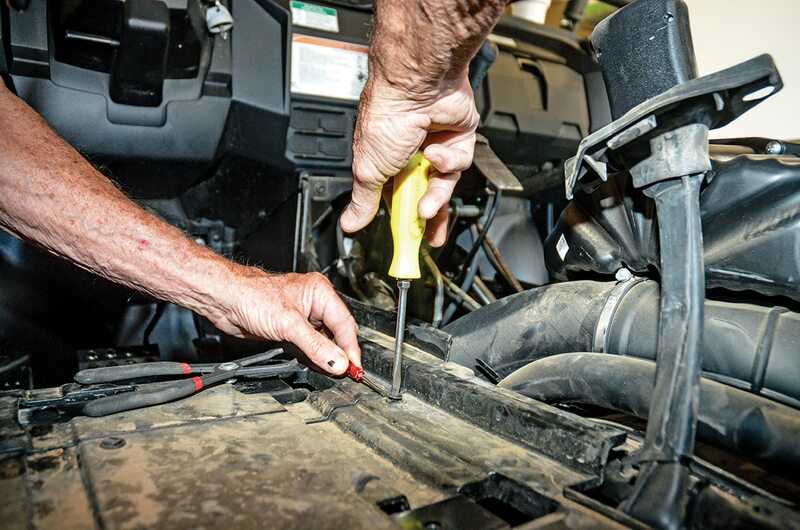 Replace the fender fasteners and between-door panel bolts and rivets; be sure to work the seat belt into its slot. 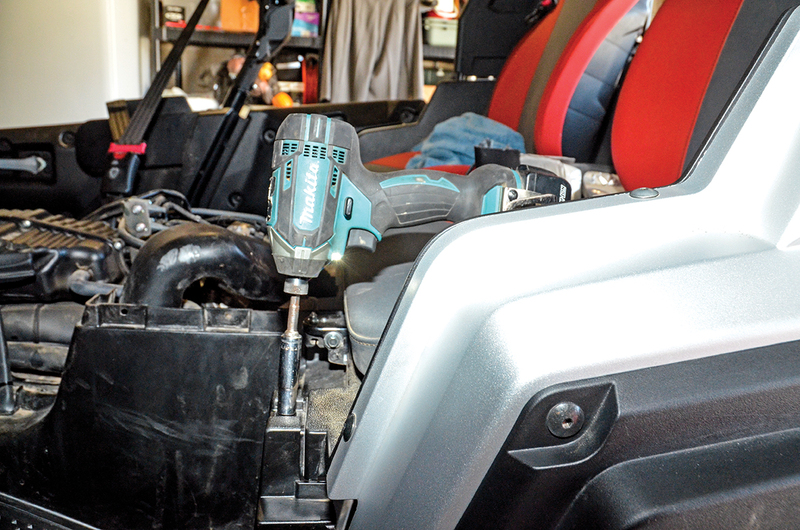 Replace the driver’s seat sliders and tighten the mount bolts. Work the console over the parking-brake lever and range selector and slide onto its base.